It’s Time to Clean Your Football Equipment! Written by Sarasota Sun Devils on November 30, 2018 . Posted in Blog, Football Parents, Youth Football. If you are the parent of a child who plays football, you already know that football equipment can stink. Smelly equipment is unpleasant to keep in the house and is also unsanitary. However, cleaning football equipment isn’t common knowledge. 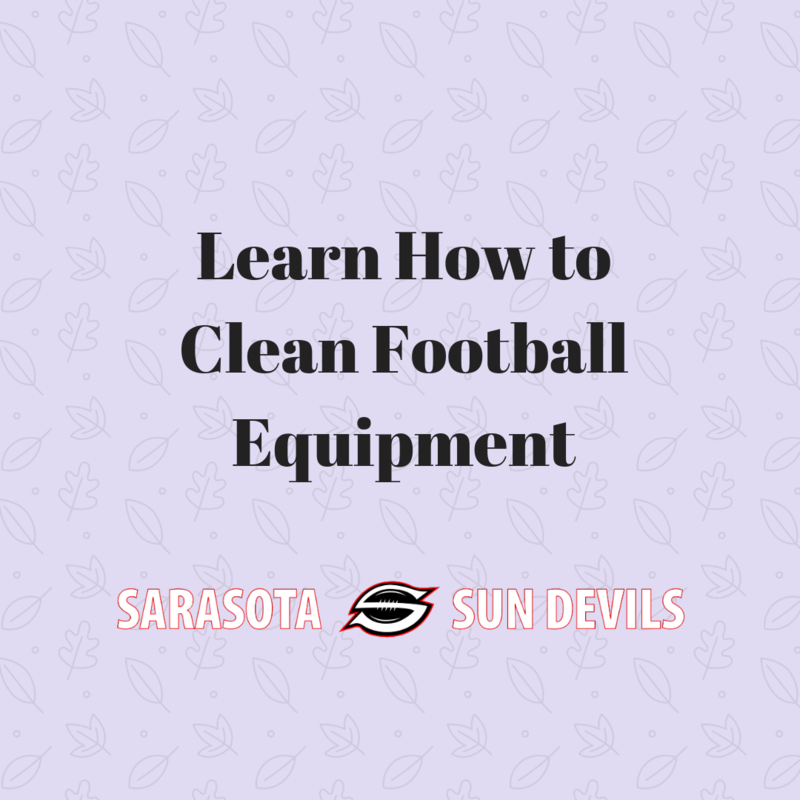 If you want to know how to clean football equipment, just keep reading! Step one in cleaning football equipment is airing it out. Instead of storing your child’s football equipment in their room, closet, or the trunk of your car, let the equipment air out. Airing out football equipment allows the items to get rid of moisture and bacteria. If you have a mudroom, garage, or porch, keep football equipment in these areas after practice and games. The second step in cleaning football equipment is wiping it down. Use antibacterial wipes to remove any dirt and germs that have collected during wear. Wipe down the shoulder pads, chin strap, and inside of the helmet at least once a week to maintain cleanliness. For mouth guards, use dish soap and a toothbrush to clean the item safely. Next, be sure to run items through the wash. Not all sports equipment can be washed in a washing machine, but jerseys, uniforms, gloves, and girdles can be. Run these items through the washing machine and hang dry them to avoid accumulating an absolutely awful spell. The final step to follow when cleaning football equipment is air freshening spray. Spray equipment, uniforms, and even your car with an air freshener to remove the unpleasant smell. Having a child who plays football may be a lot of work, but it is also very rewarding. Consider signing your child up for the Sarasota Sun Devils to help them learn about competitiveness, teamwork, sportsmanship, and scholarship. You can learn more about the Sarasota Sun Devils by visiting our website.